Twenty children and six adults died when a gunman rampaged through a primary school in Newtown, Connecticut, firing a semi-automatic rifle before killing himself. Here is what is known so far about the events which began on a seemingly ordinary Friday morning, only a few days away from the Christmas holiday. The gunman, named by police as Adam Lanza, 20, shot and killed his mother Nancy Lanza at their home in Newtown, an affluent town of 27,000 people about 60 miles north-east of New York City. It is still not clear why Lanza killed his mother, who was found wearing her pyjamas in bed, shot four times in the head with a rifle. Mrs Lanza, a gun enthusiast who practised at shooting ranges, had divorced Lanza's father Peter in 2009. Nancy Lanza was a teacher, but education officials say that have found no links between her and Sandy Hook Elementary School - contrary to earlier reports. After killing his mother, Lanza apparently stole a number of her guns and drove her car five miles (8km) to the school, which he attended as a child. The school has about 700 pupils aged between five and 10. He was dressed in black fatigues, reportedly with a utility vest with a number of pockets. He was carrying an assault rifle, thought to have been a Bushmaster AR-15-style rifle, a civilian version of the military's M-16. Police say this was the main weapon used during the shooting, though Lanza was also carrying two handguns loaded with high-capacity magazines. Police say a fourth weapon, a shotgun, was later found in his car parked outside the school. Visitors to the school have to be "buzzed in" by a member of staff. But at about 09:30, Lanza shot his way into the school, police now say, contrary to earlier reports that he had been let in. When the police arrived, they found the school's front windows were shattered. The head teacher and the school psychologist were shot dead in a corridor as Lanza made his way into the building. 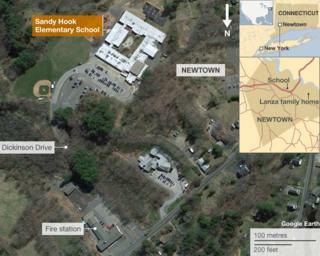 Newtown police were notified of shooting at the school over their radios at 09:36. "Caller is indicating she thinks someone's shooting in the building," a police dispatcher said. A school employee ran through the halls warning of a gunman on the loose, and someone switched on the intercom, alerting people in the building to the attack by letting them hear the mayhem in the school office, a teacher told AP. One young survivor said the gunshots sounded like pots and pans falling to the floor. Teachers locked their doors and ordered children to huddle in a corner or hide in cupboards as shots echoed through the building. They used different methods to calm their students. Some read stories while others pulled out crayons for the children draw. Some of the teachers sat with their children holding teddies or comfort blankets in huddled silence while others whispered Christmas carols, not pausing when they heard screams or shots over the intercom. Connecticut medical examiner H Wayne Carver said that the seven dead children he personally examined had been shot between three and 11 times each, and two of those were shot at close range. "The bullets are designed in such a fashion that the energy is deposited in the tissue and so the bullet stays in," he said. "This is a very devastating set of injuries." Authorities say the shooting only lasted a few minutes and victims were found in two rooms. Lanza apparently shot himself. "The shooting appears to have stopped," the police dispatcher radioed at 09:38, according to the New York Post. "There is silence at this time. The school is in lockdown." Police said that when they found the killer's body he was lying with hundreds of unspent rounds. Fearful the gunman could still be at large, police swarmed into the building, breaking windows to enter at several points, Lt Paul Vance of the Connecticut state police said. Meanwhile, other officers searched and secured the woods surrounding the school, police said in a statement. Inside the building officers encountered a horrific scene: 18 children and six adults shot dead, including popular principal Dawn Hochsprung, 47. Two more children would later die from their wounds. Paramedics wheeled a wounded woman out on an office chair. The officers went from room to room removing surviving children and staff from classrooms. They did not fire their weapons during the search. A library clerk who had ordered 18 children into a storage room before locking and barricading the door gave the children paper and crayons to keep them occupied. The police arrived at the door within an hour, the clerk, Maryann Jacob, told the Associated Press. "One of them slid his badge under the door, and they called and said, 'It's OK, it's the police'," she said. The schoolchildren were escorted hand-in-hand and were told the shut their eyes as they passed the principal's office, believed to be the scene of much of the carnage. They were taken to Sandy Hook fire station, where worried parents began to gather. Connecticut Governor Dannel Malloy went to the fire station. "Evil visited this community today and it's too early to speak of recovery," he said later. More details about Lanza have begun to emerge. He studied at Newtown High School, but made few friends. His mother pulled him out of the school and taught him at home because she was unhappy with the school district's plan for his education. Intelligent but shy and nervous were the most common memories of those who studied beside him. Richard Novia, who was head of security at Newtown High School, said it was clear Lanza was a "very scared young boy" who had "some disabilities". He was protective of his personal space and sometimes appeared to completely withdraw into himself or to "take flight", Mr Novia told AP, meaning his mother had to be called in to resolve the problem. Mr Novia helped to run a technology club, which Lanza attended, and said he had to keep a close eye on him while the club was using soldering equipment or electrical equipment. "If that boy would've burned himself, he would not have known it or felt it physically," he said. But the gunman's background suggests no clear motive for the rampage. Investigators have found no letters or diaries that could explain his actions, and he reportedly did not utter a single word during the attack. After tentatively identifying Lanza, police rushed to the house on Yogananda Street where they found his deceased mother. Medical examiners arrived about two hours after the scene had been secured, Dr Carver said. They began taking photographs of the slain children and adults in a temporary facility similar to a military field hospital set up by the school, he said. By 01:00 on Saturday the bodies had been transported to the medical examiner's office in Farmington, Connecticut, where post-mortem examinations were carried out. Relatives of the victims were shown photographs of the deceased to help in identification - they did not view the bodies, Dr Carver said. Initial reports about a shooting at the school identified Ryan Lanza, Adam Lanza's older brother, as the gunman after he was mistakenly identified by a police official. Ryan Lanza, 24, apparently posted Facebook updates on Friday afternoon that read, "It wasn't me" and "I was at work". In northern New Jersey, where Ryan Lanza works at an accounting firm, police took him into custody for questioning. A construction worker who witnessed Ryan Lanza's initial encounter with police said he was handcuffed but remained calm, the Record newspaper reported. He was said to be co-operating with investigators, was not suspected of having a role in the attack, and had not been placed under arrest.